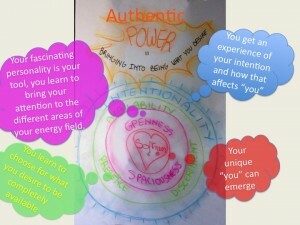 Guest House Facilitation (GHF) is a complex, interconnected and continuously changing practice, it is fluid and smart-flexible. GHF is a process of experiencing and only afterwards you are able to express what you experienced in words. The basic idea is the welcoming of all inner and outer guests. The Latin word “facilitare” literally means making easy. The name Guest House refers to Rumi’s well-known poem the Guest House as a metaphor for our practice of facilitation. and reconnects land and people. Guest House Facilitation brings together a variety of proven transformational attitudes and technologies to use in the full service of the “now”, in other words, to provide a deeply embodied experience of life and your unique contribution to the arising of a new world. Each time the Guest House Facilitation will be different and new. It is a living experiential learning practice. Whatever is present in the group will further flavour our experience and create its unique mix of inner and outer processes. We know how we start, but we don’t know how the process continues. What we do know is that you will be changed through this experience of Guest House Facilitation and more ready to act in the world, to bring all of what you have already accomplished into fruition. We create a safe container, a Guest House. 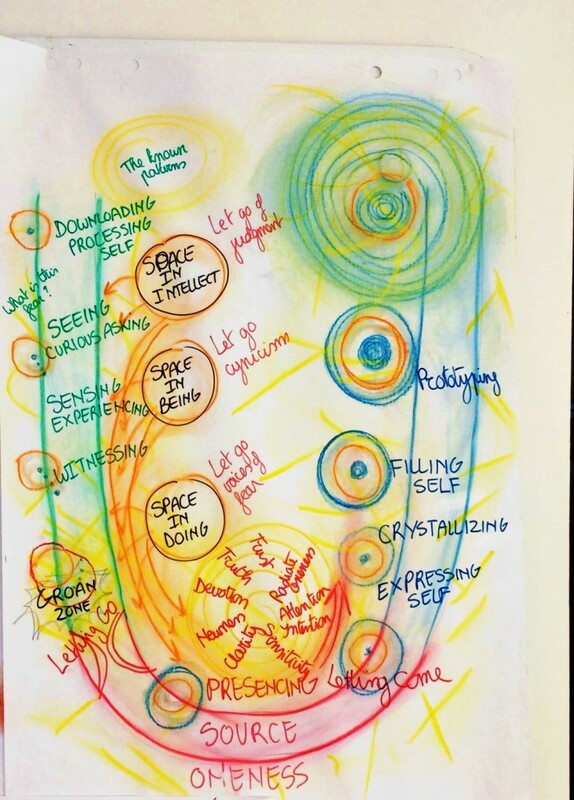 You engage into a journey to remember your wholeness, to unfold self-organization and to reconnect with the evolutionary purpose of your human experience. We work with groups of 6 to maximum 9 persons. This journey leads you ongoing through 7 stages. When you finished you start again. Bring the newness into the collective field. 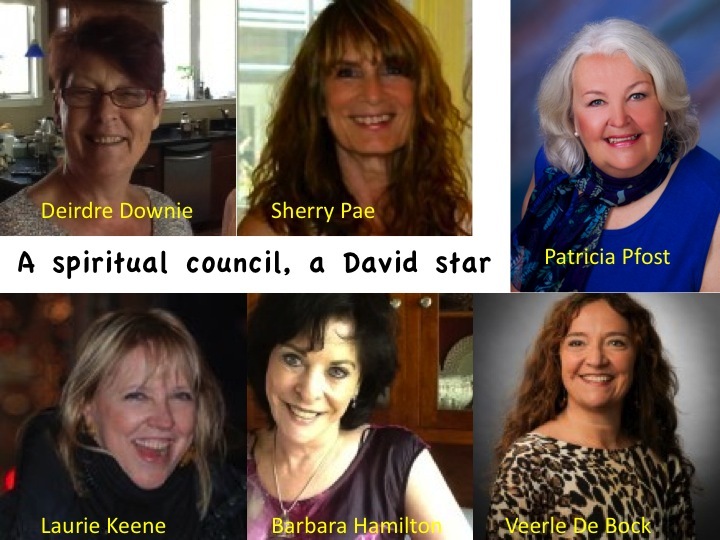 Welcoming all voices… acknowledging the value of all voices in our lives and their contribution to life’s purpose. The inner guests are all our thought, feelings, emotions and sensations. The outer guests are all participants in our group. Everybody who is present has a role in the bigger whole. Even the whispers in the background are important. Also our circumstances – everyone and everything that is present in our lives are voices that count. All what happens in the moment is welcome. Taking 100% responsibility… experiencing ourselves in the world as being 100% responsible… not only an integral part of the whole, but BEING the whole. Origin Ho’oponopono, a Hawaiian Healing method. ‘Focusing’ is the practicality of Gene Gendlin’s philosophy of the implicit. Focusing is creating a pause. 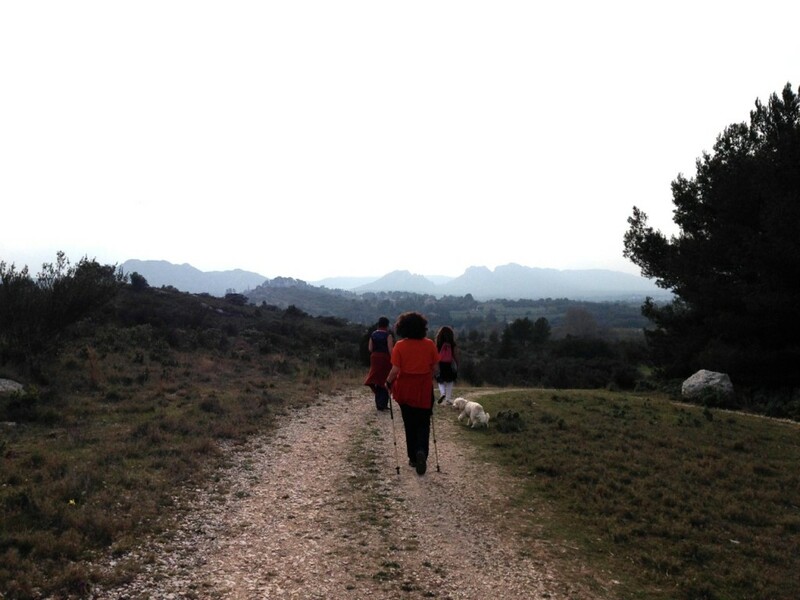 The facilitator invites open attention to what is happening in the body of the participant. 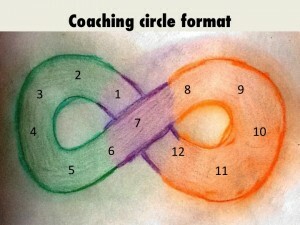 A space unfolds and new possibilities can be carried forward (www.focusing.org). 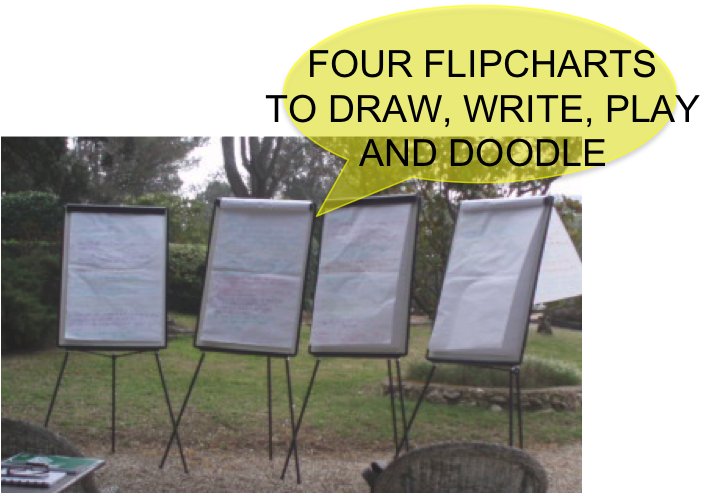 ‘Dynamic Facilitation’ is a meaningful conversation invented by Jim Rough, it is the glue in our Guest House Facilitation. Dynamic Facilitation is not a dialogue; each participant addresses the facilitator and what he or she is sharing is reflected back as writing on flipcharts named ‘data’, ‘solutions’ and ‘concerns.’ The shifts in the conversations are indicated through ‘how-statements’. (www.tobe.net). The triad ‘Witnessing, Asking, Experiencing’. Asking is a dance between the inner process and the external event that is happening in the environment. You curiously ask yourself “what is here now?” with whatever happens to you and get a sense of how it allows you to arrive here – ‘now’. The act of asking prompts us to experience what is happening in our body. It leads us deep into our felt experience and often extends to a variety of expressions – sensory, emotional, mental and spiritual. Once we are experiencing the sensations in our body, we are then able to acknowledge where we are through impartially witnessing what is happening now. There is no judgment; we simply notice what is happening. We do not do anything; we just allow whatever happens to unfold. Our body (red): an amazing intelligence, our most intimate partner. 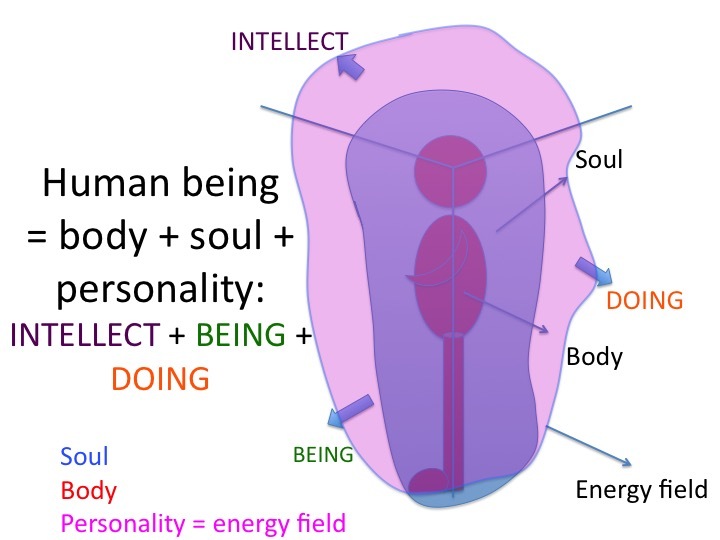 Our mind/personality (magenta) with three distinct modalities/aspects of our energy field: Intellect, being and doing. Intellect: the energy field around our brain. Being: the front side of our energy field. Doing: the back side of our energy field. Childhood development and family constellations: Our inner guests are the different manifestations of our consciousness. Consciousness forms energy and designs our different inner guests during our childhood development. All of who have their unique energy field or personality, their body shape and functions and their part of our soul. They express themselves with joy or pain, with shame or excitement, with delight or dark thoughts and any mixture of those. The cosmic principle of the ‘life pulse’ and its effects on emerging processes within self, other and the earth. You will learn to discern the different aspects of the life pulse – stasis, expansion and contraction. 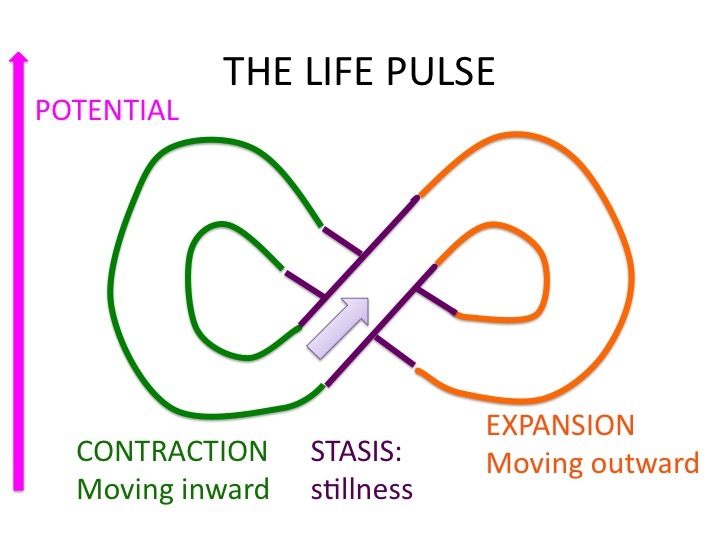 Experience the pause in stasis, the inward movement of contraction and the going out in relationship of the expansion and how to live them in your daily life. ‘Circle Practice’ combines thoughtful speaking from the heart and the mind with listening deeply. (http://www.peerspirit.com.) This is an ancient practice used by most cultures to hear all voices and come to healing. The U process, which represents a stepwise process. We start creating space in our intellect, recognize our taken-for granted assumptions and begin to hear and see things that were not evident before. The second step is creating space in our being to feel beyond the intellect, achieving a deeper level of attention. Finally we are summoned to create space in our doing, the ability to unlock our deepest feelings of commitment. We arrived at the state of ‘presencing’. First step: Observe, observe, observe all that is, what you can perceive with your normal senses. What you can see, hear, smell, taste, touch…. Third step: What is underneath that which you observe with your normal senses and that which you perceive in between? What does this being share with you? Silence in order to arrive and balance. A silence where nothing happens and yet everything happens. We practice silence in GHF as the absence of words and actions. We acknowledge that the true silence is a still mind and not the absence of words or actions. Being in nature is always part of GHF in whatever way it may present itself in the land that welcomes the gathering or training. It can take the form of a silent walk, a swim in the lake, a dance outside to the four directions. Nature reminds us that our bodies are a inherent part of a much bigger intelligent design, that although they seem separate they are not. Nature assists the digesting of the processes within the field of GHF. Each gathering of GHF a metaphorical tree is created in the opening circle. The magic already begins to emerge through this tree, revealing the patterns present in the group and the genius potential. 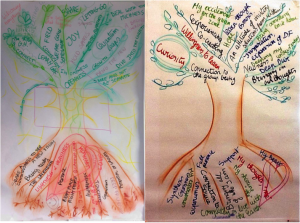 A tree is a powerful image for the community within the field of GHF. Its basic colour is brown, you can make an endless variety of brown colours with mixtures of the primary colours blue, yellow and red. In the colour code of GHF blue is the colour of the soul and the grid of soulssubstance. Yellow is the colour of the collective field and red is the colour for our bodies. The tree reveals the roots of GHF, that what we source, offer, nourish and sustain in the field of GHF. The trunk is the connection happening and the unfolding community. The crown has the branches of GHF reaching out across countries and continents and the leaves are all the creations within GHF. How can you join GHF? Workshop: offers you an amazing opportunity to have a unique experience of GHF. A workshop can have any duration between 3 hours and several days. We can organize it or you gather a group of participants and invite some of us to facilitate. Training: the purpose is to train people who are called into the field of GHF in order for them to apply the method in their own settings and organizations, to give workshops or to create their own unique method. The minimum duration of a training is three days. 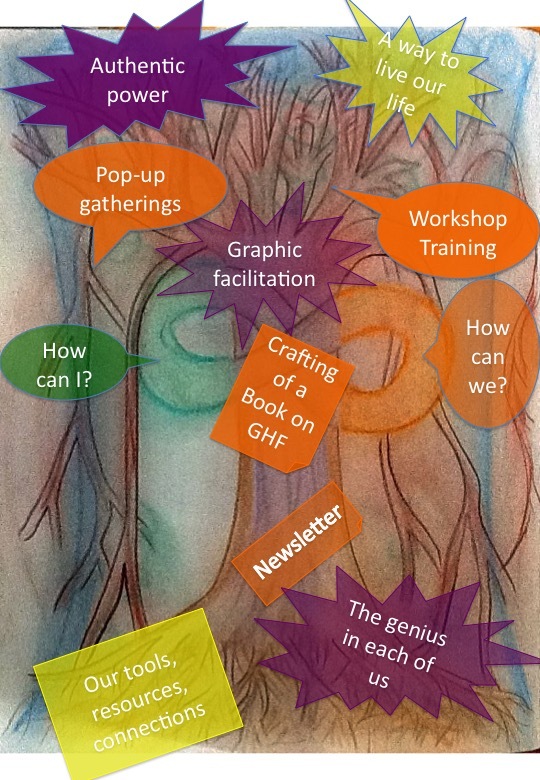 Newsletter: connects all of us across countries and continents and helps us to weave the GHF tapestry. One of the offerings of the newsletter is a look inside the book on GHF Veerle De Bock and Elaine McGoogan are crafting. The name of the book is: Practice don’t Preach Listening: Guest House Facilitation. You offer your energy through showing up, you offer your attention through listening, you offer your time through choosing to be as fully available as possible in the moment, as you focus your attention, through your intention your direct money towards what you desire to bring into being. 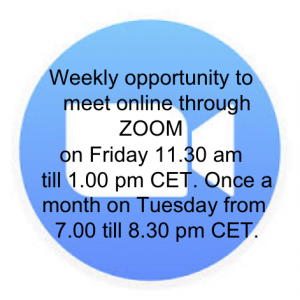 Next to your deposit of 100 euro which confirms your seat in-person or online through Zoom, we propose that you decide for yourself after the training what you want to offer in return of what you received, regardless whether you attend in-person or online via Zoom. You receive access to your authentic power. This enables you to direct your resources to what you desire to bring into being. Enhanced ability to recognize and take fresh, appropriate and authentic action in the moment, rather than acting from expectation, assumption, projection, habit or history. Identification of next steps in individual and group development. What kind of continuing support would serve you and where you can get it. Time, dates of planned Guest house facilitations or trainings, price and how to register is available on the “events” section of this website. 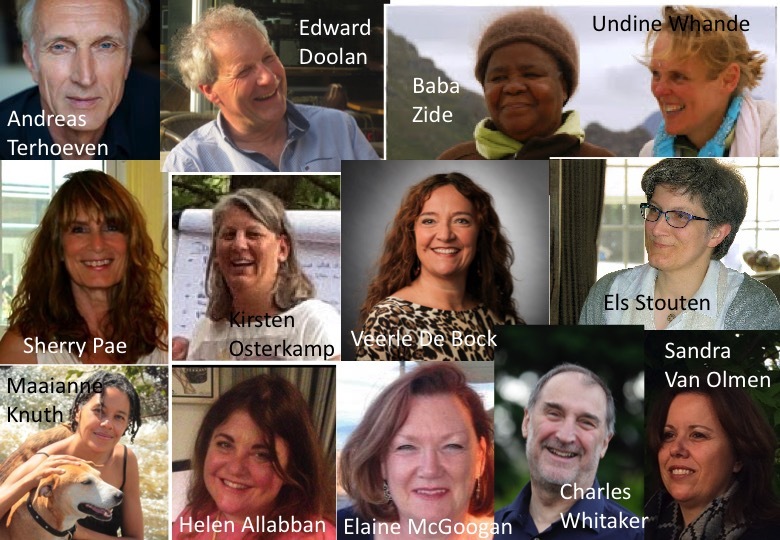 Some of the amazing wonderful people who contributed their unique resources to GHF and play a role in the emerging of our practice.